If you’ve been battling with an outdated washing machine or dishwasher for years now, you’re probably thinking quite seriously about replacing them. They aren’t getting your dishes or clothes clean, and having to run multiple cycles is costing you both water and money. At Integrity Repipe in Los Angeles, we love helping people solve their plumbing problems, but it isn’t always the pipes that are the cause of insufficient appliance operation. Sometimes the machines are simply worn out, but if you’re upgrading your appliances, it’s a perfect time to repipe your home. If you’re okay with being without a washing machine or dishwasher for a few days, we can arrange a repiping installation time that coincides with the removal of your old appliances. Everything will be moved out of the way, and your new appliances may not be arriving for a few days, and with the space open, we can access the pipes in your kitchen and laundry room and get to work. Depending on your needs and desires, we can repipe your entire home, or focus on one section of the house where the plumbing has been a problem. We use only the highest quality PEX plumbing products and when we’re finished, you won’t have to worry about high water bills or clothes and dishes that aren’t clean. While your appliances may be outdated, it could be a combination of old machines and old plumbing that is causing the problem. 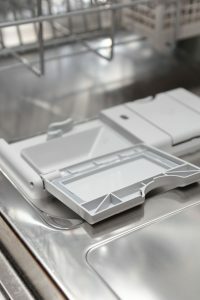 If you only replace the dishwasher, but still have the same flow and pressure problems, that’s a good indicator that your pipes are to blame. By having us come in during your upgrade and replace your old pipes with new, reliable PEX tubing, you’ll be able to feel confident every time you put dishes in or throw in a load of laundry. PEX plumbing can be installed for both cold and hot water lines, and pressure and temperature should be maintained throughout your home. When you need PEX repiping services in LA, you can count on Integrity to do the job right the first time. We have years of experience with all types of plumbing systems, and understand how to best approach each situation. Above all else, we want you to have the peace of mind that your plumbing will be reliable every time you use it, and that there are no hidden problems lurking behind the wall.